... entire structure. Moreover, by installing the ultra-light tilting wheels (only 2,5 kg the couple), you will have a 3 meter boat easier to carry than your baggage for the holidays ! ... accessories accenting the luxurious feel of this superb tender. You'll be amazed at the performance and beauty of the best looking RIB jet tender in the water. 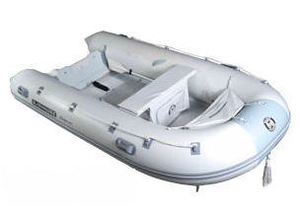 An inflatable boat can be anything from a small tender to a luxurious rigid inflatable with a cabin. The two main categories are the rigid and the pure inflatables, though the latter may have rigid floorboards. These craft are light and seaworthy. Equipment options are numerous, depending on size, and the inflatable pontoons are made of increasingly sturdy materials. These factors make inflatables multipurpose boats for recreational or professional use. Such boats consist of inflatable buoyancy pontoons, compartmentalized for greater security in case of puncture or leak, and a soft or rigid floor, depending on model. Small versions use outboard motors, while larger rigid inflatables may have inboard engines, including the waterjet type. Choice will depend on load capacity, intended use and budget. Inflatables can carry more weight than rigid hulls of the same size. Models, features and manufacturers abound.